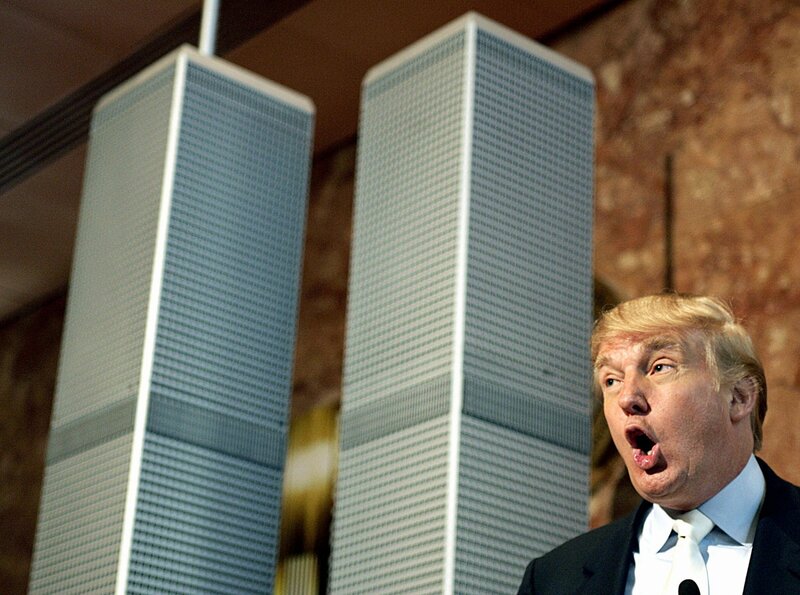 Before becoming president, Donald Trump uttered some bizarre remarks about the 9/11 attacks that were the deadliest terrorist acts in U.S. history. On September 11, 2001, militants linked to the Islamic extremist group al-Qaeda hijacked four airplanes and crashed them into the twin towers of the World Trade Center in New York City, the west side of the Pentagon near Washington, D.C., and, after passengers fought back against attackers onboard, rural Pennsylvania. “40 Wall Street actually was the second-tallest building in downtown Manhattan, and it was actually before the World Trade Center the tallest, and then when they built the World Trade Center it became known as the second-tallest, and now it's the tallest," Trump, then a real estate developer, said in a call to the local television station WWOR just hours after the attack. "And I just spoke to my people, and they said it's the most unbelievable sight, it's probably seven or eight blocks away from the World Trade Center,” Trump continued, “And yet Wall Street is littered with two feet of stone and brick and mortar and steel." “I predicted the 9/11 attack on America in my book ‘The America We Deserve’ and the collapse of Iraq in @TimeToGetTough,” Trump tweeted a decade after the tragedy, seemingly boasting about his foresight and promoting his book published that year. Trump has not deleted the retweet of his own tweet. “Hey, I watched when the World Trade Center came tumbling down, and I watched in Jersey City, New Jersey, where thousands and thousands of people were cheering as that building was coming down. Thousands of people were cheering,” then-presidential candidate Trump said during a rally he held in Birmingham, Alabama. Trump reiterated his remark later to ABC News and said the cheers came from parts of New Jersey with “large Arab populations.” There is no evidence to support his claim of the celebrating in New Jersey. "The World Trade Center came down because Bill Clinton [didn't] kill Osama bin Laden when he had the chance to kill him. And George [W.] Bush—by the way, George Bush had the chance, also, and he didn't listen to the advice of his CIA," Trump said during a Republican presidential debate to bash the former president’s brother and candidate Jeb Bush. “I lost hundreds of friends in 9/11,” Trump claimed, which if true would mean he knew at least 6 percent of the 2,996 victims. Trump adopted a more restrained tone last year. “May God Forever Bless the United States of America. #NeverForget911,” Trump tweeted, along with a video honoring the fallen, on the first anniversary of 9/11 since he became president. "Rudy Giuliani did a GREAT job as Mayor of NYC during the period of September 11th. His leadership, bravery and skill must never be forgotten. Rudy is a TRUE WARRIOR!" Trump tweeted on the 17th anniversary of 9/11. Giuliani, who drew praise for his response to the attacks, has since become Trump's lawyer in special counsel Robert Mueller's investigation into Russian interference and collusion with the Trump campaign in the 2016 presidential election. Trump then tweeted a fact. What he meant by doing so is unknown.